Our outdoor living spaces may still be wintry right now. But, this is the time to plan landscape and outdoor living projects. Here are some suggestions, with some product referrals to boot. 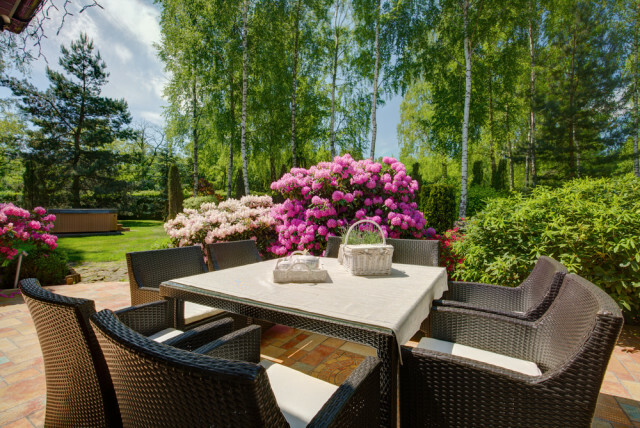 Your outdoor living space should reflect your interests and values. Even if you don’t have an acre of land to work with, that one guiding principle still applies. 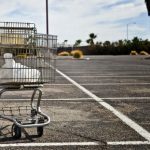 Maybe you’ve been in your space for a while now, and you’ve put off the transformation of your yard. Or, maybe you’ve moved to a new place and are looking to take the space you’ve inherited and make it into a useful and comfortable space. What kind of projects should you start with? Well, here are 14 ideas to add to your list or to dive feet first into. Along with the ideas are a few ideas for surfacing, furniture, and other features. Take a look at those, too. Your deck provides a staging ground for your life outside. Whatever use you have for your outdoor space, a deck is a stalwart addition, and makes for a valuable feature for your home as a whole. 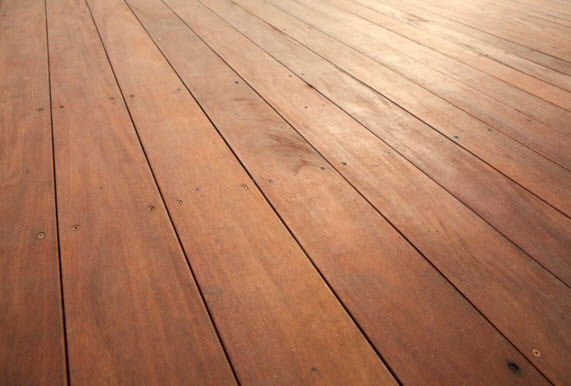 Decks come in all kinds of layouts and using all kinds of materials. 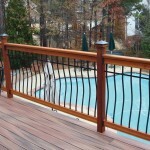 Wood decking is a gold standard in the minds of many. 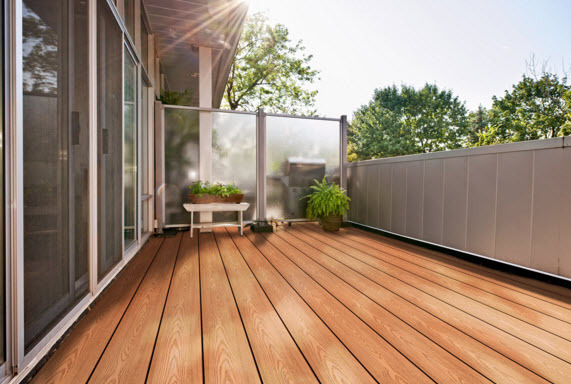 But, composite and vinyl decking are also coming into their own in the twenty-first century, no longer just in place as a temporary outdoor surface. Green World Lumber Premium Exotic Wood Decking from BuildDirect. 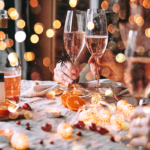 A patio also comes in many forms, with as many layouts and uses of materials that the physical limitations of a space, and the less limited extent of our imagations will allow. Natural stone pavers, brick, and even easily installed deck tiles can be your ticket to establishing a base of operations for life in your outdoor space. A pool is a center of activity during the summer months. It’s also a visual focal point a lot of the time. So, why not decorate it a bit? One good way to do that is by making your pool surround interesting. Concrete and natural stone are great options. 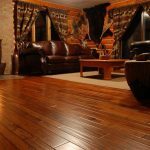 So are deck tiles, which can be laid on any flat surface, and can be easily taken up again when necessary. 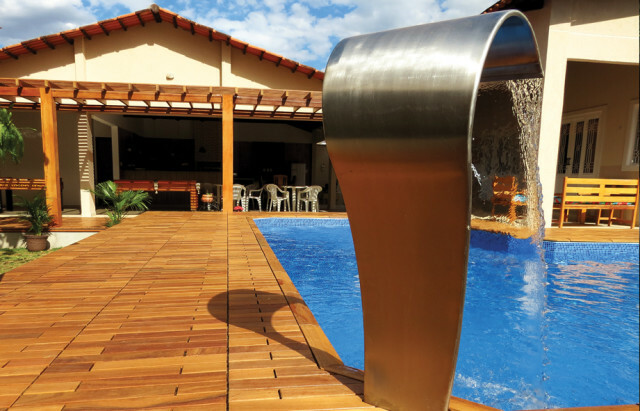 Ipe deck tiles from BuildDirect. Using some of the same kinds of materials that you used for your patio, a path can add form to the formless when it comes to your backyard. Paths have practical value too, of course. But, one underrated one is the visual definition a garden path adds to a space. 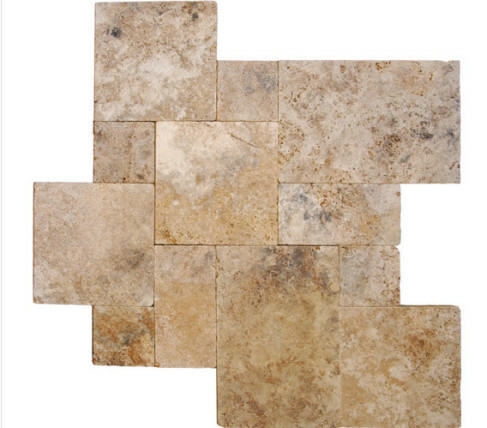 Cabot Travertine Pavers – Pattern Sets (Tumbled/Pattern Set/Walnut Rustico) from BuildDirect. 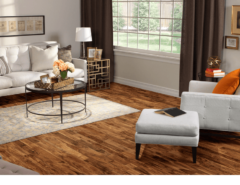 It provides a way for you to subdivide a property, and to help you to connect areas together, provding important visual cohesion. Your life outdoors isn’t necessarily about your backyard. Sometimes it’s about your side yard, and even your front yard. In this, many homes prominently feature the driveway, which can dominate your curb appeal. 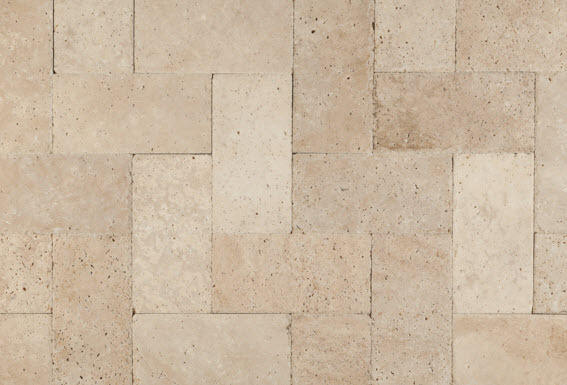 Cabot Travertine Pavers – Turkish Series (Gold Commercial Honed and Chiseled 6″x12″x1 1/4″) from BuildDirect. If you’re looking to reinvent your driveway with new surfacing, there are a number of options to consider. One is natural stone, of the same types that you might use for a path or patio. 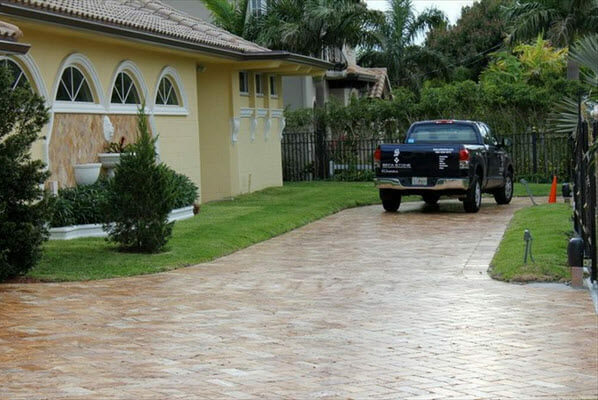 Another is turf, which adds the natural look of grass, and adds the advantage of allowing rain to seep back into the local watertable, which is certainly an environmentally-responsible way to re-think a driveway. Even if you don’t use turf, an arrangement of pavers that allows for rain to seap back into the soil can help with run-off, too. In the same way that a path can help to define an outdoor space, so can a fence. 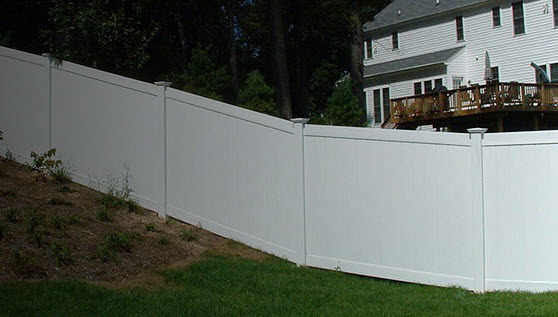 Deciding what you need a fence to do for you (privacy? 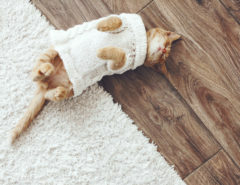 safety for kids and pets?) 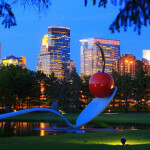 is an important question to ask yourself when planning an outdoor space. Meanwhile, if there’s a need in mind, these day there’s a fence to match it. Sheds can seem like a single-use kind of item. 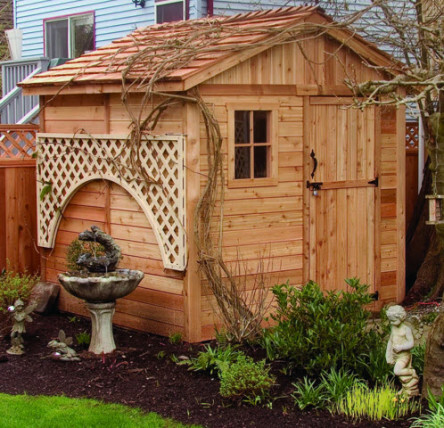 But, like the other elements on this list, a shed can be a focal point to redefining an outdoor space. Sure, many kinds of sheds are specifically designed for storage. But, others can be adapted into any kind of space, including outdoor workspaces, playhouses, reading nooks, and beyond. What will you use your new shed for? Outdoor Living Today Storage Shed – Lifestyle Series (8′ x 8′ The Gardener’s Wooden Cedar Shed) from BuildDirect. I’ve said it before and I’ll say it again; food tastes better when you eat it outside. Maybe that’s why outdoor kitchens as a staple in outdoor spaces are coming into their own in the twenty first century. Outdoor kitchens as an idea are actually thousands of years old. Creating one of your own makes you a part of that ancient tradition. But, what will you need? 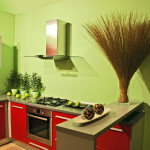 Kitchen appliances designed for outdoor use provide a great many advantages. One is that you get to cook and eat food outside, and as I mentioned, food just tastes better this way. Another is that the heat of cooking doesn’t get locked up in your house. This is particularly relevant during the hot summer months. Sinks, storage, and refrigeration units complete the project, letting you prepare a meal and do all the clean-up all in one place without once having to step inside. All the while, you make the most of your outdoor space, expanding the possibilities of your life at home. Browse for outdoor kitchen appliances, fixtures, and storage. Where there is food cooking outside, there is ideally somewhere nearby to eat it, also preferably outdoors. As such, a dining room within close proximity to your outdoor kitchen is a good idea. To plan a good one, you’d probably also like to move past the plastic surfaces of the past, and into a more elegant space. With that, there are now plenty of options in the twenty-first century outdoor dining space for you to consider. 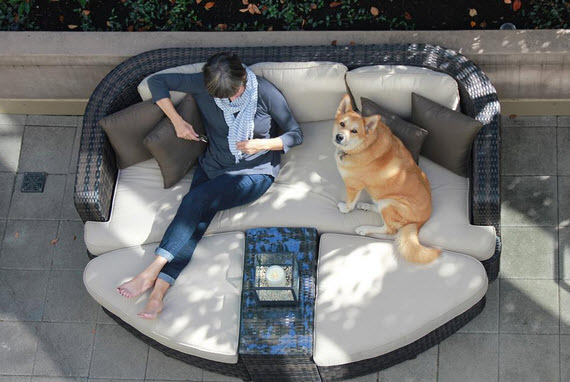 Outdoor furniture has evolved, with materials that have been specifically designed to resist the effects of UV rays and moisture. This includes the frames for outdoor furniture, as well as the fabrics that make up seat cushions; resistant to fading and from mold growth. 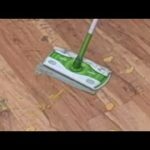 They’re also much easier to clean, and to store during the off-season. 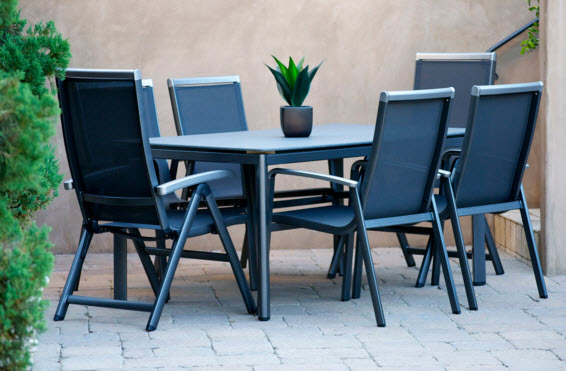 Mayaro Dining Sets – Aluminum Medium (Ideal for 6 Seats) from BuildDirect. 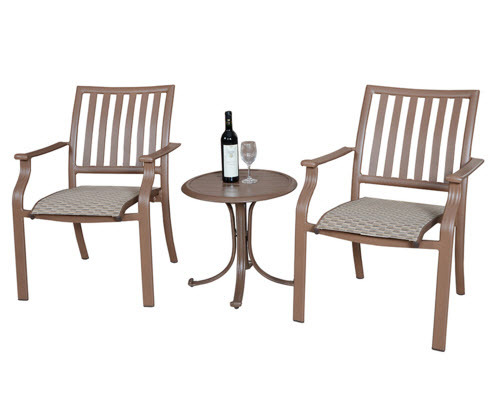 Browse for outdoor dining sets. A place to enjoy the outdoors comfortably is a common goal when looking to redefine a backyard. Creating a fully functional outdoor living room is a good place to start. As mentioned earlier, patio furniture has evolved considerably past the flimsy plastic seating of yesteryear. These days, you can invest in a variety of seating arrangements from two-seat chat sets to conversation sets that include sectionals, supplementing them with low tables, serving carts, and even full blown daybeds for you to stretch out in to read your book, check your mentions on Twitter, sip a cold drink, or all of those. Kontiki Conversation Sets – Wicker Daybeds (Monte Carlo 4 Piece DayBed Set) from BuildDirect. 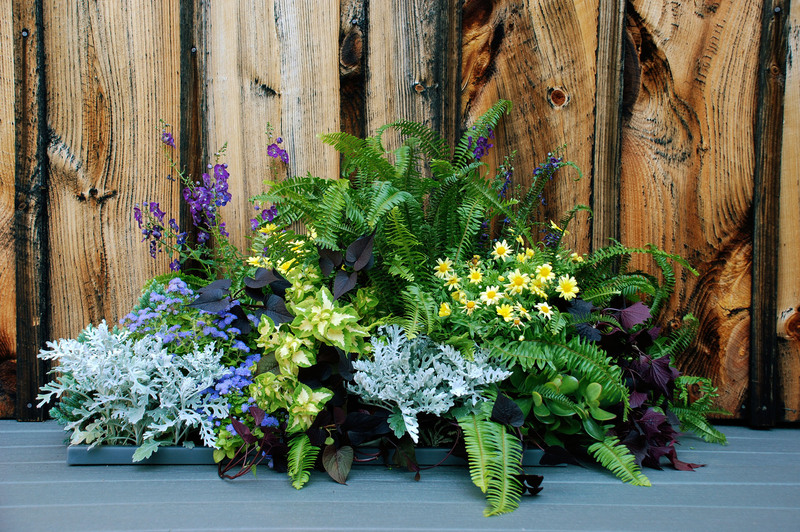 Show off your colorful foliage and make it a part of your outdoor living space with ease using stylish planters. Some planters are free-standing. 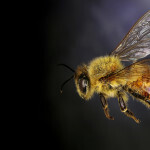 Others drop right into a window or even flush with a decking surface. Either way, boosting the leafiness of your outdoor environment offers all kinds of positive effects, including a sense of serenity we touched on above. Wellspring Deck Accessories Drop-In Planters from BuildDirect (“Gray”, 16″ Drop-In Deck Planter 2pk). Browse lawn and garden products. 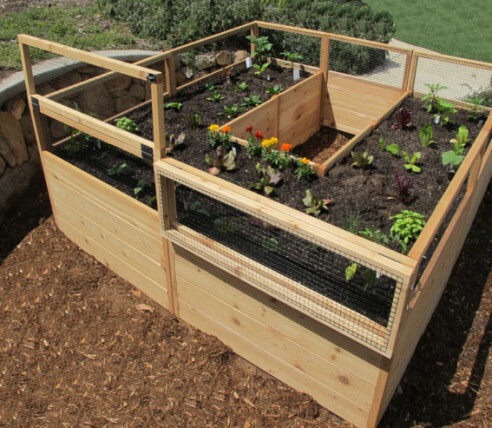 Similar to the above, when your looking to start herb gardens, vegetable gardens, and even flower gardens, a raised bed is a versatile way to do it. Suitable for many different kinds of spaces, a raised bed garden adds flexibility to gardening, especially for those who aren’t given to too much stooping over when doing so. A raised garden helps to reduce that, and (once again) adds to the overall visual effect of an outdoor living space. Hewetson Lawn & Garden – Wooden Garden Beds (8′ x 8′ Raised Cedar Garden Bed) from BuildDirect. A morning room is slightly different from the standard outdoor living room. With a morning room there is a very specific goal in mind; easing into your day. This being your space, and your rules, maybe the “morning” part of this is more like “evening” or “after lunch”, or whenever time of day is needed to stop, get some perspective, and move onto the next thing. Morning rooms are for solitude, or for quieter times with the one you love. Comfortable seating, surfaces for books, drinks, mobiles, and tablets are common elements in a morning room. When you’re looking to inject some serenity into your life at home, and make the most of your outdoor space too, planning a space like this can be the first step in a more centered and relaxed life. Speaking of serenity, there’s nothing quite like the sound of water to relax us, and reconnect us with nature. Water features can help to replicate these effects. This doesn’t have to mean grandiose fountains and full-blown duck ponds (although it might mean that for you). It can mean smaller fountains and urns that provide these elements of sensory calming. 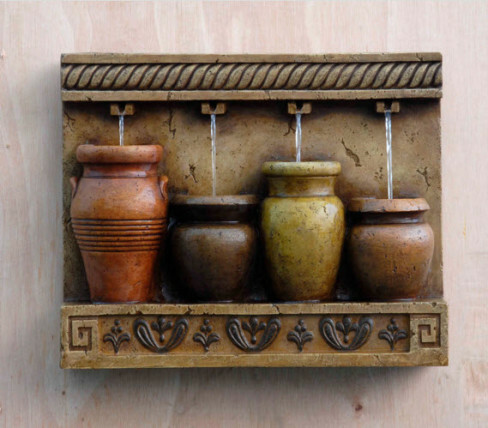 Kontiki Water Features (Colorful Pots Wall Water Fountain) from BuildDirect. When you want to practice your putt, why not do it literally in your own backyard? Thanks to how much artificial turf has evolved, that’s definitely on the table. 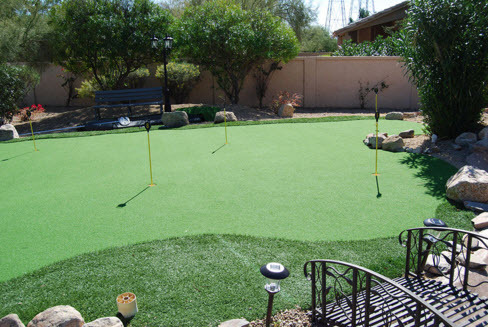 Treviso Artificial Turf – Golf Collection (Golf Green 15’x30′) from BuildDirect. Depending on where your outdoor living space is in relation to sun and wind exposure, not to mention how visible you are to your neighbors, shade and shelter are two basic elements that can make or break your enjoyment. 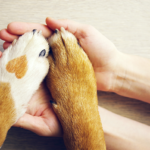 There are a number of options to consider when it comes to taking care of business on this score. 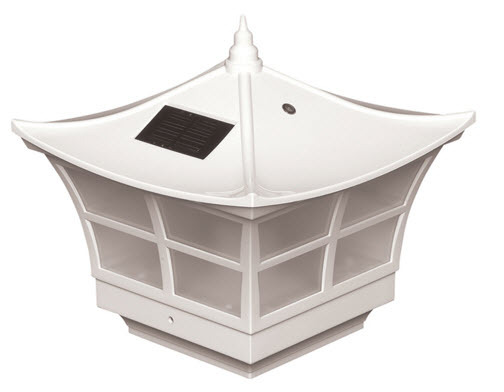 St. Lawrence Wicker Post Gazebo with Sunbrella Canopy from BuildDirect. Pergolas are a popular solution for providing cover for outdoor rooms of all kinds. The same goes with awnings. 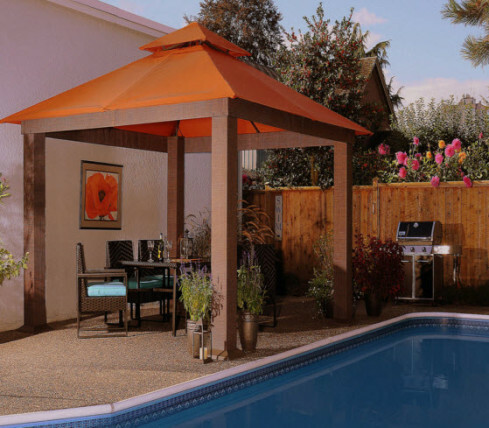 Even the humble patio umbrella can help to alleviate the harsh exposure to sun and wind. Browse shading and cooling products. When things get dark and you and your family and friends want to continue to enjoy an outdoor space, having some control is important. If you want to move beyond the cold glare of a single backyard light, there are options for outdoor lighting that you can incorporate into your deck or patio. Once again, this isn’t just about the practical side of things (which it is!). It’s also about how you can integrate lighting into a space and make it look good. When you can gain this balance, you’ve really got something. Even during the summer months, things can get a little nippy when the sun goes down, or as it’s coming back up. Even in the off-season, you still want to be able to spend time in your outdoor space. Why let something like colder weather stop you? For that too, there are options. Kontiki Heaters & Fireplaces – Wood Burning Fire Tables (Fire Sense 30″ Portsmouth Fire Pit) from BuildDirect. Heat lamps and firepits are two big ones. 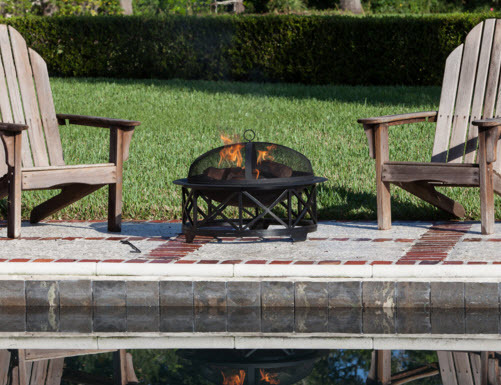 A fire table is another, helping you to integrate your outdoor heating with your furniture arrangement in the same way your outdoor lighting was integrated into youe deck and patio. And when they’re not in active use, fire tables can be moved at your leisure. What are your plans for your outdoor spaces this year? Your outdoor living areas are as much a part of your home as your interiors are. So, what are some of the ways you’re thinking of transforming those spaces closer to your own visions of what they should be? Are you going to wait until spring? Or are you going to get started right now? Tell us all about your outoor living spaces and your plans for them this year in the comments section below.